The latest estimate reckons that there were about 200 cafes and bars in the town altogether – about one for every 60 residents. A counter usually ran along the street to catch the passing trade, selling cheap takeaway food from large jars. Wine was stacked up behind it and there were tables in a back room for sit-down eating and drinking. It was the reverse of today’s society, where the rich eat out and the poor cook up at home. In Pompeii, the poor, living in tiny quarters with no facilities, relied on cafe food. Rich Pompeians did occasionally eat dormice. Or so a couple of strange pottery containers – identified, thanks to descriptions by ancient writers, as dormouse cages – suggest. But elaborate banquets were a rarity and just for the rich. The staples were bread, olives, beans, eggs, cheese, fruit and veg (Pompeian cabbages were particularly prized), plus some tasty fish. Meat was less in evidence, and was mainly pork. This was a relatively healthy diet. In fact, the ancient Pompeians were on average slightly taller than modern Neapolitans. One of the puzzles of Pompeii is where the kids went to school. No obvious school buildings or classrooms have been found. The likely answer is that teachers took their class of boys (and almost certainly only boys) to some convenient shady portico and did their teaching there. 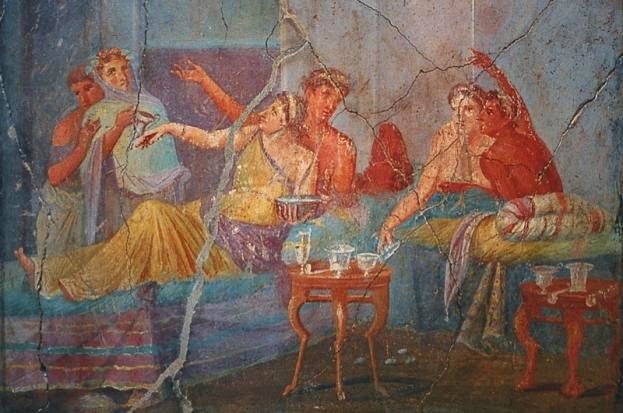 A wonderful series of paintings of scenes of life in the Forum seems to show exactly that happening – with one poor miscreant being given a nasty beating in front of his classmates. And the curriculum? To judge from the large number of quotes from Virgil’s Aeneid scrawled on Pompeian walls, the young were well drilled in the national epic.